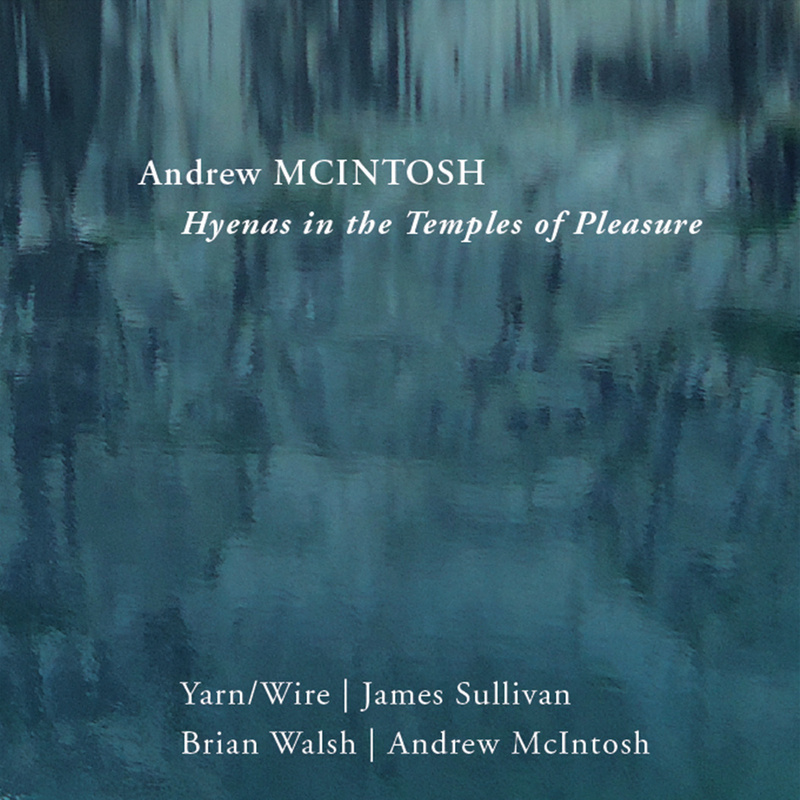 Andrew McIntosh‘s debut is undoubtedly one of the most interesting recent releases when it comes to young composers, one of the reasons being that he grabs onto a history of music that does not directly lead, as it does with many of his peers, to the great minimalist moment of the late 1960s and early 1970s. Instead, this history twists and turns through that period towards the likes of Ben Johnston, Lou Harrison, and Harry Partch. The very beginning of the album, four parts of the Symmetry Etudes suite, even recalls some of Kevin Volans’ work – this is a modern project that does not seek the city as its model, but something else, something more naturally rational, a way of perceiving that is in awe of the stars beyond the skyscrapers. This is perhaps why the artist prefers to use just intonation in the aforementioned suite, which comprises literally two thirds of the album, a move we’ll see might have other kinds of significance. The album itself is divided into three parts, opening with four Symmetry Etudes, followed by Hyenas in the Temples of Pleasure, and concluding with another four Etudes. The order, however, is slightly tricky: piece “V” of the Etudes has taken the place of piece “I” and viceversa, breaking the linearity of sequential order and turning it into a kind of circular enclosing in which, like the 12 and 6 in a clock, these two numbers end up being directly opposite one another. At this point, I wish only to suggest there must be a myriad Pythagorean implications in this (perhaps the whole thing represents the symmetrical relations in the circle of fifths? ), but I have neither the expertise nor the intelligence to explore this fully. However, you, dear ACL readers, will probably be better at finding such a thing out. Given that the artist states in the liner notes that he likes “to think of perfection and imperfection as magnetic to each other”, there is a deep play at work between the two clarinets and violin the suite was composed for, in terms of a geometrical relationship from which an isosceles triangle is born: the instruments never push against each other, and often even reach surprisingly similar droning sounds, sustaining a sort of unequal balance that appears both robust and fragile. 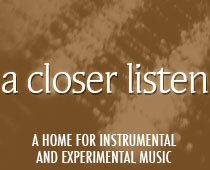 Remove a clarinet and the work might survive, but remove the violin and the wall they built will slowly crumble away. And just what is it that they keep within? What is the symmetrical operation in the album’s order keeping enclosed? The middle piece, “Hyenas in the Temples of Pleasure”, represents the composer at his most imperfect, or so he says in the liner notes. Using a more spontaneous, less mathematical and therefore less certain technique, the piece flows with an eloquence that is not proper to thought but inspiration, a Romantic adventure that in wilderness does not find truth but another kind of reasoning, one that appears disjointed, exuberant and wasteful but that, if studied closely, if understood on its own terms, is systematic, restrained, almost (and it’s a very important ‘almost’) mechanical. It was written for two pianos and two percussionists, two of the staples of modern music instrumentation (one as the remains of tradition now re-appropriated, the other as its most adequate successor, if one follows one of John Cage’s narratives), their uneasy relationship explored in a way that makes both strain and push each other. “Hyenas…” is not a balanced piece, its geometry twisted by the percussive harmonies that linger, by the quickness and certainty of the piano, by the understanding that something with amazing melodic potential has been ‘lost’ to the thumps, bumps, and clangs of its modern ‘relative’. The heart of the temples beats with the desire not to look at the stars but to look at someone’s eyes, fascinated not by their forms but by the ripples in the iris, the will they emit with every pulse. The Etudes, the symmetry of the natural, encloses this desire, rationality holds its supposed opposite inside, at the middle, at the center of it all, restraining a wilderness that is not to be found outside but within.